Will Gaza Be Left to Its Misery in a Middle East Absorbed by Other Conflicts? 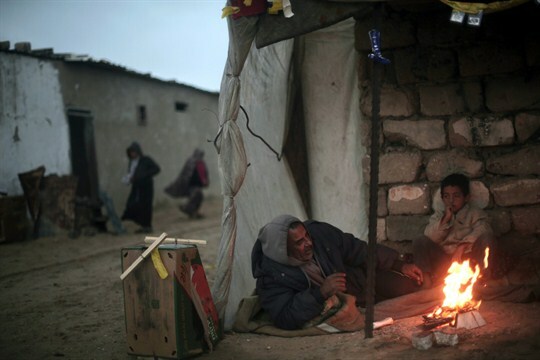 A Palestinian man and his son warm themselves by a fire during cold, rainy weather in a slum on the outskirts of the Khan Younis refugee camp, southern Gaza Strip, Jan. 5, 2018 (AP photo by Khalil Hamra). Earlier this month, representatives of 20 countries sat around a table in the White House to discuss ways to ease the humanitarian crisis in Gaza. That same day, on a road inside Gaza, a bomb exploded, striking a convoy carrying a high-level Palestinian delegation, including the Palestinian Authority’s prime minister. The group was traveling through the Hamas-dominated coastal enclave to inaugurate a new water purification plant.